Today's manicure is simple, still recovering from yesterday I think, but I'm totally worn down and just blah in general. I did a different take on a sponged gradient, sponging at the cuticle edge instead of the tip edge. I used Essie Vermillionaire as a base for the orange nails, Zoya Yummy for the ring finger, with Absolutely Alice sponged on the blue nail, and Extravaganza! on the orange nails. Topped all nails off with 2 coats of Seche Vite top coat. I like the idea of a "reverse" gradient manicure. Now I wanna try doing my version of it. its really nice the sparkles looks ausumm..
Complimentary colors make the artist in me happy. That zoya blue is divine. :) I love the reverse gradient. 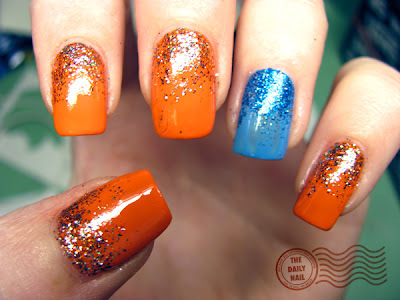 I love gradients and I love accent nails, so I LOVE this! I may have to try it. i noticed that you only ever photograph your left hand... is that because it's the 'better' one, as you're right handed? you do paint both hands the same right? i would be interested in seeing, say, the target manicure in comparison between your left and right hands! I am not good at anything even relatively close so it'd be nice to see both. I really like this simple design :D the colors look so pretty that I'm tempted to go out and try to find them lol. I like the reverse gradient. was it tougher to do the reverse instead of the usual way? Ohh, this looks so nice!! Your nails look like they're glowing from within with those colors. I've never used orange polish except for detail, but now I might.